The diagram to the right shows you the different packs that exist in Soot. First, Soot applies the jb pack to every single method body, or in other terms to every method that has a body. Native methods such as System.currentTimeMillis() have no body. The jb pack is fixed and it is concerned with the creation of the Jimple representation. It cannot be changed! wjap, the whole-jimple annotation pack. Note though, that whole-program packs are not enabled by default. You have to state the -w option on Soot’s command line to enable them. jap, the jimple annotation pack. jtp is empty and enabled by default. This is usually where you want to place your intra-procedural analyses. jop comes pre-equipped with a set of Jimple optimizations. It is disabled by default and can be enabled by using Soot’s -o command line option, or by using the switch –p jop enabled. jap is the annotation pack for Jimple. Here, annotations are added to each Jimple body that let you or others or a JVM assess the results of the optimizations. By default, this pack is enabled but all default phases in the pack are disabled. Hence, if you add your own analysis to this pack it will automatically be enabled by default. Note that every Transform added to a (non-whole) Jimple pack must be a BodyTransformer. As the diagram at the top shows, Soot next applied the packs bb and tag to each body. The bb pack converts the (optimized and tagged) Jimple bodies into Baf bodies. 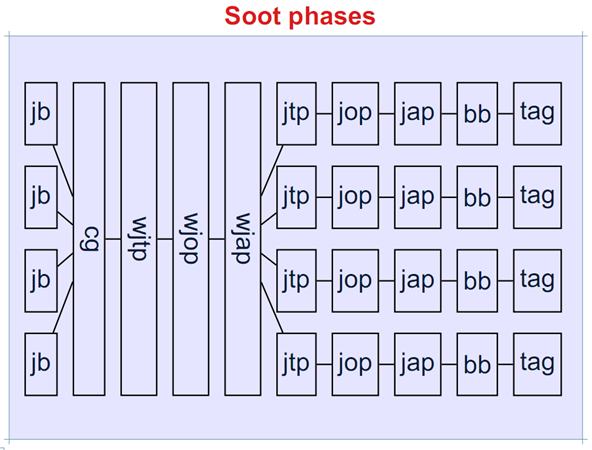 Baf is Soot’s stack based intermediate representation from which Soot creates bytecode. The tag pack last but not least aggregates certain tags. For instance, if multiple Jimple (or Baf) statements share the same line number tag then Soot will retain this tag only on the first instruction that carries this tag, to gain uniqueness. Since a little more than a year, Soot has an additional pack, db, not shown on the slide at the top. Its sole use is to enable or disable certain transformations when decompiling code into java using the –f dava command line option. It contains no actual transforms, and nothing should be added to it. Which packs are enabled when?